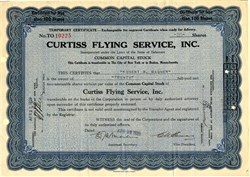 Beautifully engraved certificate from the Curtiss Flying Service issued in 1929. This historic document was printed by American Bank Note Company and has an ornate border around it. This item has the signatures of the Company's President and Secretary and is over 88 years old. The decade of the 1920s witnessed the development of commercial aviation, and an important factor in its growth was the need to familiarize the general public with flying. Glenn Curtiss was a leader in this effort as well, organizing one of the world's first flight-training organizations. 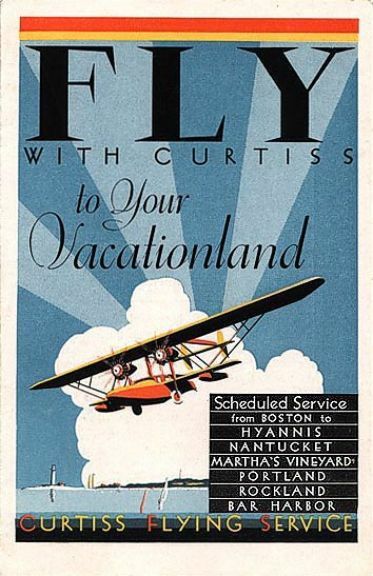 This was later incorporated - following a merger with the Wright interests - as the Curtiss-Wright Flying Service, Inc.
Curtiss Flying Service flew with amphibians from July 1929 on two routes out of Boston, to Nantucket and Bangor. The airline is reported to have operated in the New York area during 1931, but was gone by 1932. Sikorsky Amphibian�the world's safest airplane. Over half a million miles�and still flying. Lindbergh on schedule to the minute. It is the safest airplane in the world. The plane with a distinguished waiting list. The unprecedented demand for the Sikorsky Amphibian forces us to announce regretfully our inability to fill new orders for . . . months. Financier Clement Melville Keys, who controls Curtiss Flying Service, has been trying to buy Sikorsky Aviation Corp. for some time, to merge it with what has become Curtiss-Wright Corp. Inventor Igor I. Sikorsky, vice president of the company, has tried to sell to Flying-Publishers Robert Rutherford Mc-Cormick and Joseph Medill Patterson. Businessman Arnold Gushing Dickinson, president of the company, did sell it last week�to United Aircraft & Transport Corp. President Gordon Sohn Rentschler of Manhattan's National City Bank and his brother, President Frederick B. Rentschler of United Aircraft & Transport, had outbid Mr. Keys and others. The price was about $2,500,000 in United stock. For United the deal looked wise. It lines up one of the best planes in the world with other United subsidiaries�Boeing, Vought, Hamilton Metalplane, Pratt & Whitney motors, Pacific Air Transport, Boeing Air Transport, Stout Airlines. * Whether Curtiss Flying Service, a subsidiary of United's competitor Curtiss-Wright Corp., will continue to sell Sikorsky planes was last week unannounced. Inventor Igor I. Sikorsky was in Europe, last week when the deal was announced. If any one had told him six years ago when, a Russian immigrant, he founded his U. S. company, that in 1929 it would bring $2,500,000, he would have believed it. He has never lacked self-confidence. In Tsarist days he was his country's foremost aeronautical engineer. He designed the world's first successful multimotored plane (a four-motor job, 1913), flew the first multimotored seaplane (his own design, 1914), enabled the Russians to make the first heavy air bombardments of the War. Founding a Sikorsky company in the U. S. was to him a matter of course and selfesteem. He wants no anonymity of accomplishment. But he does not like business details. He is primarily an engineer. Many a Sikorsky order, many a deal, has been delayed by Inventor Sikorsky's futile enthusiasm for improvement, remodeling. He is almost the last of the big independent designers to succumb to the industry's merger movement. * Sikorsky's preferred spelling. Amphibian is more generally used. * Pacific operates along the Pacific Coast, Boeing from San Francisco to Chicago, Stout from Chicago to Cleveland. United intends this autumn to extend its transcontinental passenger service to New York, creating a San Francisco-New York fly of 30 hours.